Intro from Jay Allison: Our lead instructor for the Transom Online Workshop is a unique voice in American documentary, Scott Carrier. In this Craft Feature, he chronicles the history of approaches to documentary, with this caveat, “None of this is for sure, ok? I’m just making it up as I go, using stuff I remember from nearly a whole lifetime of thinking about it and paying attention to what other people have done. There are many huge textbooks written about the history of documentaries, go read them if you want. I like Stan Brakhage (Selected Writings on Film-Making). This web-seminar, however, is intended to be short and quick, direct multi-media ascents on the main points. So let’s begin.” Moving from the Lumiere Brothers, through Nanook, War of the Worlds, Cinema Verite, personal documentary, and NPR in the 80s, Scott riffs on his favorite things. You can feel how they’ve resonated in his own work. Our object or goal is to look at different forms of non-fiction stories, the underlying assumption being there’s more than one way to tell the truth, also with the understanding that truth telling is something we do by nature. We can’t help ourselves. As long as there have been human beings there have been stories, and some of those stories have always been about what’s “really” going on around us and why. In the beginning there’s the tool. We’re alive, we see things happening around us, but in order to tell other people about what we’re seeing we need an instrument for communication. The first instrument was the human voice, then came pen, then camera, followed by sound recorders and movie cameras, the video recorder, and now the smartphone Internet. In each case, with each new invention, we had to figure out how to use the tool to capture real events, assemble them into a narrative arc to be shown or told to other people. People always want to know what’s happening and why, it’s just the way we are. Creators in each new technology had to discover its narrative techniques and language. Bards like Homer figured out live performance of the epic poem. Herodotus figured out how to write history. Photojournalism began in the Civil War. The Lumière Brothers, original inventors of the movie camera/projector cinemagraph, started by filming real events such as a train coming into a station or workers leaving a factory. Thomas Edison, inventor of the kinetograph, invited actors and athletes to come to his studio and perform. Let’s look at some of their films: “Workers Leaving the Lumière Factory (“La Sortie de l’Usine Lumière à Lyon” Lumière Brothers 1895) and “The Kiss” (Thomas Edison 1896). These films are what we might now call raw footage. They are single shots, no edits. The films by the Lumière brothers are more like what we now call documentary — real things that were happening in the world. Edison’s films are more like what we call drama — actors performing on a stage. But because there’s no narration or edits, no montage of images, it’s hard to tell what the films are about or what they mean. They are not stories. The train comes into the station, but who is on the train and why are they coming to town? Workers leave the factory, but what are the working conditions inside? A man and a woman are kissing, but how did they meet and how will it end? Stories arouse emotions and engage the imagination of the audience. In real life things just happen, in stories we give them meaning. Stories are constructed, made up of parts called the beginning, middle and end. Events proceed in an arc of tension, and at the end people and places are somehow different than they were in the beginning. There’s usually a reason for the change, sometimes good and sometimes bad, and the reason usually makes sense and the whole thing seems true, like it really happened. Because it did. It happened in our minds. That’s how stories work. The stuff we experience through our imagination always amounts to much more than the words on the page or the images on the screen or the sounds coming out of the speakers. The narrative arc has this power, and both drama and documentary use it. It took about ten years, roughly from 1895 to 1905, for early filmmakers to figure out how to make edits and use narration to tell a story. The first narrative films were dramatic: “The Great Train Robbery” (Edwin Porter 1903) and “A Trip to the Moon” (“Le Voyage dans la lune” Georges Méliès 1902). It wasn’t until the 1920s that people started making narrative documentaries. I don’t know why it took so long, but it did. The first two popular documentaries were “Man with a Movie Camera” (1929) and “Nanook of the North” (1922) and they are quite different in their approach and style, good examples of different documentary forms. The idea behind “Man With a Movie Camera” (entire movie 66min.) was to document and promote the success of the proletariat revolution in the new Soviet Union. The producer, Dziga Vertov, believed that movie cameras and movies could show the truth about how things are and how people should live together on the planet. To him the new technology was like a gift from heaven, ‘Now the truth can finally be told!’ I think this was a reaction to every new medium — print, audio, Internet. But it ain’t necessarily so. Vertov gathered the raw footage for his story by having a cameraman go out in the street, into the homes, into the factories to record real life, real people, doing real things. But then there came the problem of how to use the raw footage to tell a story, how to cut it together in a way that would tell us ‘What does all this reality mean?’ Vertov realized that the construction of a story might make the whole thing untrue, not real, so he made up a set of rules to follow in the editing process — how to put one thing with another and then another in a way that told the truth. He called this method Kino Pravda, or film truth. Vertov believed in his method, but while “Man With a Movie Camera” is beautifully shot and edited it’s just boring as hell, unless you were actually there, and nobody these days was there. Vertov’s method doesn’t tell a story where we care about the people involved. We don’t even know who these people are. We don’t know the good guys from the bad guys and we don’t know what’s at stake. So in the end we have a bunch of reality but we don’t know what it means. In “Nanook of the North” (entire movie 78min.) Robert Flaherty makes a movie with a very clear story — Man versus Nature. Who will win? He has a hero, Nanook, an Eskimo famous for killing polar bears, and a villain, the harsh environment. Flaherty spent about three years filming Nanook and his family as they went about their daily lives in the frozen arctic. Midway in the process he lost all his footage in an explosion/fire because the film stock in those days was made with nitroglycerin. (Talk about Film Truth!) So he had to go back and re-shoot everything, which took another year and in the process decided it was okay if Nanook just faked catching a seal by using one that was dead and frozen in storage, things like that. He staged events. When this show was broadcast people believed it was true. Orson Welles told them at the beginning of the show and the bottom of the hour that it was a performance, but this didn’t seem to make a difference. The reason people believed it was true was because it was performed as if it were breaking news. The story begins with what we are told is a live broadcast of dance music, very relaxing. It only takes about a minute before we forget we’re listening to a radio drama, and this is exactly when the live music is interrupted by a live news report of a meteorite that’s landed in a farmer’s field outside Princeton, New Jersey. Then it goes back to the dance music, then it goes back to the meteorite, only now there are noises coming from inside the meteorite and then a hatch opens and a monster comes out and it’s like the Hindenburg crashing all over again only now the Martians have landed. OH MY GOD! The reason why this works is because Welles mixes the form of science fiction with that of news reporting. This had never been done before, so I guess it caught some people off guard. Welles also switches narrators. The show begins with a host introducing the live music, then goes to a reporter in the field, then to a news host or anchor at the radio station in New York who introduces different locations as the story unfolds. All very convincing even though this may not have been technically possible in 1939. Welles also changed narrators in Citizen Kane. Each narrator tells his or her version of the real Charles Foster Kane. As I said before, it took about 30 years after the invention of the movie camera before the first narrative documentaries were produced. “Nanook” used a dramatic arc with a conflict (man versus nature) and resolution (life goes on in the beautiful but threatening arctic). “Man With a Movie Camera” eschewed the dramatic arc (the proletariat had won already) and tried to present an objective account (no narration, just raw footage edited according to a set of rules) of a day in the life of a new country. “Nanook” was popular around the world. “Man With a Movie Camera” was not. People want a story, something that arouses our emotions — good versus evil, boy meets girl, a stranger comes to town. We want our reality to come packaged this way, then we know what it means, the moral of the story. We don’t want to look at a place where everybody is equal and happy and the problems have been solved. The documentaries of the 30s, 40s, and 50s followed a dramatic arc of some kind, not a new documentary form, just one perfected along the lines of propaganda. There were two reasons for the move toward propaganda. One was theoretical — when you make a documentary you’re basically trying to convince the audience that this is the one “real” version of reality, the way things really are. The other was practical — it cost a lot of money to make a movie, so the people who made them were rich, or in power, in control of the infrastructure necessary to pull off such a huge economic investment. “Will to Power,” produced by the Third Reich in 1934, is perhaps the best example of documentary as propaganda, but “Why We Fight” (Frank Capra, 1943) is pretty much the same thing, only we don’t usually call it propaganda. “Will to Power” is the story of the rise of the Third Reich and its mission from God to take over the world. “Why We Fight” is a series of “information films” produced during and after the war by the U.S. War Department, showing how the good guys, with God on our side, defeated the forces of evil. The reason all documentaries were dull is that they were lectures, picture illustrations, or interviews, which is the same thing. Real-life never got out of the film, never came to the television set. The Drew Associates believed documentaries were boring and so obviously constructed by the voice of power that the genre was all but dead. They wanted to go back to Vertov’s idea of documenting natural behavior, natural events, without the heavy-handed propaganda or ‘Voice of God’ telling everybody what to think. They realized the one main problem in documenting natural behavior was the film equipment itself — the cameras and tape recorders and lights were too big and heavy to keep up with natural behavior and events; everybody had to stop what they were doing and wait for the equipment to get set up and then they were self-conscious because they were obviously on camera, and self-conscious behavior is just not very interesting, because it’s not really real. You need good actors to pull off something like that, and most people, in most places, are just not up to it. So they re-designed the equipment. They developed a lightweight camera with a big view screen so the cameraman could see the frame without holding the view finder up to his eye. This made people being filmed more comfortable because they were able to look the cameraman in the eye and maybe forget about being filmed. Another innovation was wireless sync sound. Up to then all audio recorders were hooked to the cameras by a hard wire that kept the tape recorder and film camera running in sync so that the editing process wasn’t a nightmare. The Drew Associates got rid of the wire and put crystal clocks, nearly perfect, in both the camera and audio decoder. If you don’t understand how this works, it’s OK. The important thing is they got rid of the hard wire and this freed the cameraman and audio recorder to move about a scene independently. And I have to stop right here because nothing I say is going to make any sense unless you watch some of the films produced by the Drew Associates. The key phrase in the above quote by Bob Drew is “find a dramatic logic in which things really happened.” This means they tried to find stories that didn’t need narration or lecture, stories that would tell themselves, like a primary election or Bob Dylan’s tour in England, something that already had a beginning middle and end structure to it. They didn’t like narration, they thought it was phony and that really good stories didn’t need narration. The problem was and still is that those really good stories are hard to find. About 99.9% of the time life just doesn’t come packaged that way. Sure, if you’re going to film John Kennedy or Bob Dylan doing important stuff where a lot is on the line, then you’re probably going to be fine without narration. But what about all the other stuff in the world that happens without any clear structure or rock stars, situations which need to be narrated to be understood? And what’s the deal with believing there’s only one best way to tell a true story? This isn’t right, or if it is then everything I’ve said so far is wrong, and everything I will say will be pointless. No, for sure there are many ways to tell the truth, and the rules of cinéma vérité provide only one way. It’s OK to use narration in a story. An excellent film that demonstrates how narration can work in a cinema vérité film was made in 1985 by one of Richard Leacock’s students at MIT. Ross McElwee was a film student studying cinéma vérité under Leacock and he got a grant to make a documentary about General William Tecumsah Sherman’s march through Georgia during the Civil War, but what he did instead was make a film about his own loneliness and his search for a new girlfriend. Yes. He narrates the film throughout, speaking of his own emotions and desires, commenting on despair. And yet his film, “Sherman’s March,” was called a cinéma vérité masterpiece and won the Sundance Film Festival for documentaries in 1986. It’s not really a cinéma vérité film. It’s something else, something new, and should have been given a new name. I guess no one could think of one. The reason why “Sherman’s March” is a different form of documentary is this: it doesn’t pretend that there is an objective reality; it’s a totally subjective presentation. And the film doesn’t even pretend that life unfolds with pre-packaged beginnings, middles and ends, because in the end McElwee is still single, still alone — there is no end to his story. The film was shot with a cinéma vérité camera (big view finder) and a small tape recorder that could fit on McElwee’s belt. He was a one-man crew, and the most amazing thing about the movie, the thing that makes it work and hold together, is the way the people interviewed are not bothered or affected by the camera in his hand. McElwee, using the small, lightweight equipment succeeds in capturing, documenting, very intimate and personal moments where the people being filmed and recorded don’t seem to care or even know they are being filmed and recorded. They act naturally and speak honestly, and the result is mesmerizing because we almost never see this. People almost always change their behavior when they are being recorded. McElwee somehow used the camera to get them to let down their defenses and open up. Instead of sitting back and trying to become invisible, recording without interfering, McElwee used the camera to make the story happen. In this way McElwee took cinéma vérité to a new level, a new realm. So what about the history of radio documentary? I’ve been using mainly film examples because it’s easy to see how changes in technology — smaller, lighter, cheaper, better — brought changes in story form and also content. I think it’s kind of amazing the way the tool influences the kind of stories that are made with it. But what about sound recording technology? What’s the story here? The first audio recorders used a megaphone to capture sound waves that were transferred by a vibrating needle to a rotating wax cylinder. They were called phonographs and could be carried around by one person but they had to be set on a stable surface and kept still while recording. In 1890 an anthropologist named Jesse Walter Fewkes used a phonograph to record the songs and speech of the Passamaquoddy Indians of eastern Maine. For many decades this was the extent of audio documentary — recording oral history and music, very much like the first films shot by Edison and the Lumière brothers — no edits or narration or stories, just a lot of amazing raw footage. 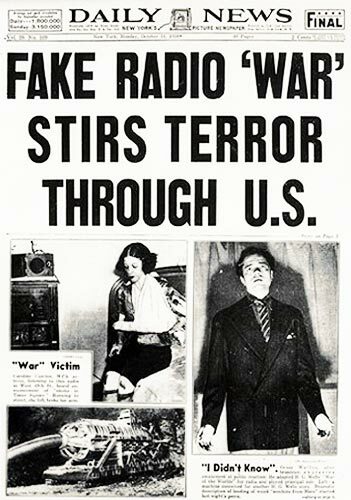 Orson Welles faked an audio documentary in 1939 with “War of the Worlds,” but I don’t think anybody was actually making them until… actually I don’t know when the first audio documentaries were made. Edward R. Murrow wrote some excellent reports for radio from the front lines of WWII, but they were basically print stories that he read into a microphone, never with interviews or natural sound. The crash of the Hindenburg in 1937 was pretty amazing because you could hear people freaking out and screaming, but again this was raw footage. Someone should look into early radio documentaries, but I’m just going to skip over it because I’m pretty sure nothing interesting happened, at least in the United States, until NPR opened shop in 1971. Many people know the story of how the philosophical mission statement of NPR was written by one man named Bill Siemering who wanted to ‘find new ways to tell stories on the radio.’ Siemering created All Things Considered and hired the first people to work for the show, and he hired people with no background in radio, on purpose. He found smart, creative people and let them figure it out. And they did, in lots of different ways. It was pretty amazing. In the early 1980’s NPR started broadcasting a wide variety of documentaries. Some were produced in- house, like “Father Cares.” Some were produced by independents, like “Road Ranger” by The Kitchen Sisters. And some were produced by independents working for NPR’s documentary laboratory led by Keith Talbot, like “A Trip to the Dentist” by Larry Massett and “Snakes” by Jay Allison. These are all different narrative forms, very different from the standard objective news report. And, when it comes down to it, the standard objective news report is pretty much the voice of the status quo; those in power tend to stay in power with the help of the media. In the spring of 1983, NPR found itself nine million dollars in debt and responded by firing a third of its staff, including Keith Talbot, the man who’s job was to find new ways of producing radio documentaries. Keith had found Joe Frank, Ira Glass, Larry Massett, Jay Allison and many others. But he was fired, his shows cancelled. NPR’s director of news and information, Robert Siegel, announced at the Airlee Convention for independent radio producers that All Things Considered would no longer broadcast Larry Massett’s “Trip to the Dentist,” meaning no more screwing around. NPR was going to become a reputable news organization like the BBC. And so it went, at NPR. This meant that the means of production were available to “the people.” Radio documentary, like film documentary, was possible for voices other than the power elite, or the status quo, hegemonic imperialists, whatever you want to call it. But I think radio had more power here than film or video; radio was much cheaper than film and video, and in radio there was NPR, which played independently produced stories to a national audience and even paid producers for their efforts (not much from the actual programs but again there were grants available). 7. Internet: Beginning, Middle and End? So now it is the 21st century and we have a new medium, the Internet, and we’re wondering if it’s going to develop its own narrative forms, just like film and radio developed their forms, over time. We’re at the beginning now, waiting to see what will happen and whether we will be able to make any money at it. Maybe it’s a medium for young people and not for old people, maybe it’s for people who haven’t even been born yet. Maybe it’s not a new medium at all, just an amazing transmission system for the old media. So now it is the 21st century and we have a new medium, the Internet, and we’re wondering if it’s going to develop its own narrative forms, just like film and radio developed their forms, over time. It is rather stunning now that recording, production, transmission and reception technologies are all contained in a smartphone. But what are we going to do with it? How will we use it to tell nonfiction stories? Most of what’s on YouTube so far is like Edison and the Lumières’ raw footage — no narration, no context, no meaning. Smartphones were excellent for documenting and broadcasting the Arab Spring and the Occupy movements, and the movements would not have been possible without them. But I think the Occupy movement failed here in the United States because the story — the context and meaning of the movement — was left to the old media, the status quo, and big media is the voice of the 1%. Raw tape of protests was not enough to ignite a revolution. The raw tape needed to be used in a story that captivated hearts and minds, and it wasn’t, at least not that I saw. There are a couple of stories, both produced by newspapers, which are good examples of what may be the future of web-based narrative form. One is “Snow Fall” by the New York Times and the other is “Firestorm” by the Guardian. Both use a combination of text, audio, and video, and both allow the viewer to choose the order and pacing of the parts — they’re interactive. Neither was done by individuals with smartphones, each was produced by a crew of professionals using the best equipment, and I’m sure each cost well over $100,000 to produce. But they are examples of what can be done, a form that can be repeated by individuals with smartphones and laptops. I watched and read and listened to both pieces, and I was very impressed. I thought, wow, I’ve really got to get better at shooting video and writing text on the screen, there’s so much I don’t know how to do. Then I wrote to my friends to see what they thought about the stories. Barrett Golding asked me one question: Did I go through the whole stories, or did I skip ahead, or just quit before the last part? In both pieces I had to admit that I didn’t go through the whole thing. I got bored with the avalanche story, and I skipped ahead to the ending of the fire story. I ended up with a lot of information but no emotional experience, no story or meaning. What’s unique to the web as a medium is just, far as I can tell, the ability to link and the ability to search easily. These are pretty much the same thing. The unique feature is that I can go anywhere I want at anytime; in other words, there is no way to control my point of view. The minute you try to “author” an experience, i.e., control my point of view, you are just reinventing television or radio or whatever. I remember Jaron Lanier once saying how great it would be if a movie were shot in Virtual Reality, since the viewer could wander around the set, watching the actors from any viewpoint. But if you think about it, this would be a total mess. Shakespeare needs the audience to see Hamlet dump Ophelia at a certain moment; if I’m off on my own staring at Polonius or checking out Gertrude’s jewelry just at that moment, then I miss the point. Shakespeare’s point, anyway. Do you remember those CD-ROM games like Myst? They were chock-full of links, but limited to the universe of the CD. Anywhere you went was someplace intended, more or less by the author. Nevertheless it was possible to hit links in such a way that you bored the crap out of yourself. Ladies and gentleman of the jury, we must conclude that the web is unsuited to storytelling. Except when it mimics older media. I think he’s right, at least for now. So what does this mean for the independent producer? It’s good news that people are always going to want a beginning, middle and end, because we’re the people who know how to do this. And it’s good that we now have such excellent equipment it can fit in a small backpack. But it’s bad that producing for the web seems like a way to go broke, and that there aren’t any solutions on the horizon. I’d like to see public media create a cross-platform magazine, similar in style and approach to the early NPR, in that it would feature independent voices exploring new ways to tell stories and pushing forward the documentary tradition. This may be, however, no more than a pipe dream. John Grierson and his team in Britain are worth looking at: https://www.youtube.com/watch?v=FkLoDg7e_ns a government information unit that went on to make documentary films about life in 1930s Britain. I think the problem with the web-based multimedia productions is that they require your full attention and participation. With radio, you can do other things–drive, cook, sew, sit in the bathtub. While watching t.v. you can also do other things–eat, cuddle, or otherwise share the experience with someone else. The stories (and story tellers) that actually stop you dead in your tracks are few and far between (Jonathan Grubert). We need a new word for the experience of taking in a multimedia piece. Listening, reading, watching are all incomplete. I did “view” both pieces from beginning to end–the avalanche story when it first came out and the bushfire story just now. And I thought the stories were (mostly) enthralling (both could have used some additional editing). But in both cases the experience wasn’t completely enjoyable. I felt conflicted most of the time–I enjoyed the multimedia experienced even as I felt trapped by it. In the back of my mind the whole time was the long list of things I had to do. This page is impressive and can be very inspiring and helpful, congratulation for compiling so many interesting docs in such an intelligent way. Besides, I was bothered by some very inaccurate writings (such as: “For instance, the Beatles “Abbey Road” was produced with a four-track Teac that cost about $800”. Which is completely false of course. “Abbey Road” was produced on a costly professionnal 8-track machine – certainly not a Teac, which at that time was not even available on the market. Hi, I don’t mean to be geeky but the Sgt Peppers album you mention was recorded at Abbey Road on Studer J37 4-track decks — two of them! George Martin used those limited tools very creatively, bouncing tracks between and manually synching them together (even though 8-track machines were available). It’s in the 2014 NAMM hall of fame. I was lucky enough to get thrown into a studio with Keith Talbot, Larry Massett and Joe Frank when I started at NPR, and I worked on parts of “Father Cares” along with then-producer Deb Amos and sound designer extraordinaire Skip Pizzi. So it’s nice to see props for both those moments in the NPR section of this history. Scott’s own work through the 80s is worth props too, along with the dedicated work done by Art Silverman in getting lots of interesting voices on the air. I would point out that NPR was doing docs of various sorts almost from its inception, so there was already a pretty deep catalog in the “Options” and “Options in Education” collections and specials by the time I arrived in the late 70s. I agree with Scott that available technology can and did influence documentary technique. At NPR the daily journalism reporters worked with a range of cassette-based equipment. But the network also had acquired high quality gear to do remote pickups of musical events, and once those pieces of of equipment were available in the building they were often repurposed (sometimes sneaked) into use by engineers for high quality documentary field capture and production as well. That synergy of music and documentary genres was one of my favorite parts of working at NPR in those years. We also benefited from exposure to European masters of audio documentary like Peter Leonhard Braun (“Bells in Europe,” certainly, but also “Hyena” and “Hip Replacement Operation” stand out in my mind for originality and sonic impact). “Bells” reached American ears through its ugly-duckling inclusion in a radio drama series out of Madison WI called “Earplay”. I agree with Margaret that multimedia creations require a different kind of attention. But don’t sell audio-only podcasts short. The current production and distribution technology makes it possible to develop communities of interest around programming types that haven’t been feasible to serve through most over-the-air broadcasters. Scott asks whether distribution pathways like YouTube can foster high quality or whether they will be inundated with un-produced raw footage. I’d hazard a guess: “all of the above”. There are some amazing video productions accessible through YT, along with the jillions of shaky images of contorting cats. This is great — thanks, Scott, and thanks, Transom. Interesting to think about how different media operate in (and relate to) time. Barrett’s question about those brilliant immersive multimedia docs is right on target — did you finish it? I find myself drawn to the form, and at some level I love and admire and envy and root for and want to create pieces like “Highrise” and “Welcome to Pine Point” and “Snow Fall” and “Firestorm,” but as a viewer/user/experiencer I confess to having trouble focusing on them for very long, and rarely get all the way through. As a journalist, I’ve been increasingly distrustful of the idea of “story,” which gives us on the producing end so much power to shape and manipulate reality for our own (generally nefarious) purposes. In theory I’d love to do verité or pravda journalism: it feels so much more honest. But we humans rely utterly on stories not just to bring distant things closer, but to compress reality in time. As Scott shows, uncompressed reality really tests our patience. But I guess it’s not just about compression; it’s also about imposing order (beginning, middle, end; character, conflict, resolution). When I sit at a computer with a multilayered multimedia piece I get restless after a couple of minutes unless the story is really cooking along. Every choice about where or whether to click triggers an internal argument about whether to bail. Which isn’t to say that audio is better. Maybe it’s just because we’re usually doing something else, as Margaret P. points out, and therefore don’t feel that we’re wasting time when we’re listening, but good audio storytelling (like good music) has a really sweet relationship with time. It can make a car trip go by in a snap. And isn’t that what we’re all looking for in the end? Chris Marker deserves a mention surely …..